KairosDB, a time-series database, provides a simple and reliable tooling to ingest and retrieve chronologically created data, such as sensors’ information or metrics. Scylla provides a large-scale, highly reliable and available backend to store large quantities of time-series data. 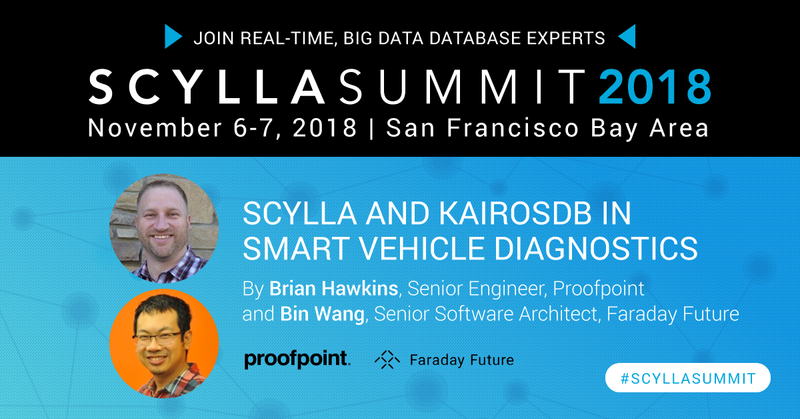 Together, KairosDB and Scylla provide a highly available time-series solution with an efficiently tailored front-end framework and a backend database with a fast ingestion rate. KairosDB v1.2.0 introduced native CQL support and we tasked KairosDB and Scylla for a performance test. We conducted two tests of KairosDB consisting of single and multiple nodes to demonstrate the performance and scalability of this solution. KairosDB is a fast distributed scalable time-series database. Initially a rewrite of the original OpenTSDB project, it evolved to a different system where data management, data processing, and visualization are fully separated. To learn how to build a highly available time-series solution with KairosDB, watch our on-demand webinar. More information about the Scylla integration with KairosDB can be found in the Scylla docs. For more information about KairosDB, please visit their website. The usage of Scylla as a highly available, distributed data store for KairosDB allows users to store a large number of metrics while easing the concern of data loss. Scylla provides high throughput, low-latency write characteristics to support millions of data point ingestions per second. KairosDB provides users with a simple API to ingest data create aggregations and rollups for fast and reliable metering and reporting. With the KairosDB 1.2 release using the native CQL language, integration of Scylla and KarioDB becomes an easy task. Compared to other solutions, the integration provides unlimited scalability, high availability, and performance. Scylla’s open-source version and KairosDB can scale to an unlimited number of instances. A dedicated Python code is used to emulate 60K / 180K sensors. Each sensor is emitting 2000 data points at a rate of one data point per second. In other words, 60K / 180K sensors are sending their data to KairosDB every second. Latency measurements were taken by $ nodetool proxyhistograms before and at the end of each run. The KairosDB schema and configuration are available in Appendix-A at the end of this post. Load: 1 loader (2 python scripts) emulating 60K sensors. Load: 3 loaders (6 python scripts) emulating 180K sensors. 2 Python scripts per loader. Batching helps on data aggregation transfers and atomicity of multi-table insertions. For more about batches, read here. The “humps” we see in the cpu-reactor load are memtables flush to disk and/or cash merges. We also proved that Scylla’s throughput scales linearly when more KairosDB nodes are added and with little impact on tail latencies. This is all done without making any changes to either the size or available resources of the Scylla Cluster. Scylla is a great choice for time-series workload. Testing found that it is necessary to use a smaller value than the default setting. This was because one of Scylla’s shard handling batches can spike to 100% CPU when handling a heavy load from KairosDB. This leads to write timeouts and poor latency results. In the example, we found the best performance when set to 50. If you are using 3 nodes, you need to divide the batch size evenly (20 per node for example) per node.